In patients with hypersensitivity to LANTUS or one of its excipients [see Warnings and Precautions (5.5)]. Changes in insulin strength, manufacturer, type, or method of administration may affect glycemic control and predispose to hypoglycemia [see Warnings and Precautions (5.3)] or hyperglycemia. These changes should be made cautiously and only under close medical supervision, and the frequency of blood glucose monitoring should be increased. For patients with type 2 diabetes, dosage adjustments of concomitant oral and antidiabetic products may be needed. The risk of hypoglycemia after an injection is related to the duration of action of the insulin and, in general, is highest when the glucose lowering effect of the insulin is maximal. 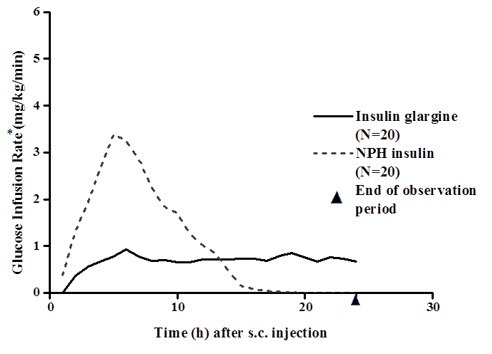 As with all insulin preparations, the glucose lowering effect time course of LANTUS may vary in different individuals or at different times in the same individual and depends on many conditions, including the area of injection as well as the injection site blood supply and temperature [see Clinical Pharmacology (12.2)]. Other factors which may increase the risk of hypoglycemia include changes in meal pattern (e.g., macronutrient content or timing of meals), changes in level of physical activity, or changes to coadministered medication [see Drug Interactions (7)]. Patients with renal or hepatic impairment may be at higher risk of hypoglycemia [see Use in Specific Populations (8.6, 8.7)]. Accidental mix-ups among insulin products, particularly between long-acting insulins and rapid-acting insulins, have been reported. To avoid medication errors between LANTUS and other insulins, instruct patients to always check the insulin label before each injection [see Adverse Reactions (6.3)]. Severe, life-threatening, generalized allergy, including anaphylaxis, can occur with insulin products, including LANTUS. If hypersensitivity reactions occur, discontinue LANTUS; treat per standard of care and monitor until symptoms and signs resolve [see Adverse Reactions (6.1)]. LANTUS is contraindicated in patients who have had hypersensitivity reactions to insulin glargine or one of the excipients [see Contraindications (4)]. Thiazolidinediones (TZDs), which are peroxisome proliferator-activated receptor (PPAR)-gamma agonists, can cause dose-related fluid retention, particularly when used in combination with insulin. Fluid retention may lead to or exacerbate heart failure. Patients treated with insulin, including LANTUS, and a PPAR-gamma agonist should be observed for signs and symptoms of heart failure. If heart failure develops, it should be managed according to current standards of care, and discontinuation or dose reduction of the PPAR-gamma agonist must be considered. The data in Table 1 reflect the exposure of 2327 patients with type 1 diabetes to LANTUS or NPH. The type 1 diabetes population had the following characteristics: Mean age was 38.5 years. Fifty four percent were male, 96.9% were Caucasian, 1.8 % were Black or African American and 2.7 % were Hispanic. The mean BMI was 25.1 kg/m2. The data in Table 2 reflect the exposure of 1563 patients with type 2 diabetes to LANTUS or NPH. The type 2 diabetes population had the following characteristics: Mean age was 59.3 years. Fifty eight percent were male, 86.7% were Caucasian, 7.8 % were Black or African American and 9 % were Hispanic. The mean BMI was 29.2 kg/m2. Hypoglycemia is the most commonly observed adverse reaction in patients using insulin, including LANTUS [see Warnings and Precautions (5.3)]. Tables 5, and 6 and 7 summarize the incidence of severe hypoglycemia in the LANTUS individual clinical trials. Severe symptomatic hypoglycemia was defined as an event with symptoms consistent with hypoglycemia requiring the assistance of another person and associated with either a blood glucose below 50 mg/dL (≤56 mg/dL in the 5-year trial and ≤36 mg/dL in the ORIGIN trial) or prompt recovery after oral carbohydrate, intravenous glucose or glucagon administration. Percentages of LANTUS-treated adult patients experiencing severe symptomatic hypoglycemia in the LANTUS clinical trials [see Clinical Studies (14)] were comparable to percentages of NPH-treated patients for all treatment regimens (see Tables 5 and 6). In the pediatric phase 3 clinical trial, children and adolescents with type 1 diabetes had a higher incidence of severe symptomatic hypoglycemia in the two treatment groups compared to the adult trials with type 1 diabetes. Table 7 displays the proportion of patients experiencing severe symptomatic hypoglycemia in the Lantus and Standard Care groups in the ORIGIN Trial [see Clinical Studies (14)]. Administration of insulin subcutaneously, including LANTUS, has resulted in lipoatrophy (depression in the skin) or lipohypertrophy (enlargement or thickening of tissue) in some patients [see Dosage and Administration (2.2)]. The following adverse reactions have been identified during postapproval use of LANTUS. Because these reactions are reported voluntarily from a population of uncertain size, it is not always possible to reliably estimate their frequency or establish a causal relationship to drug exposure. Medication errors have been reported in which other insulins, particularly rapid-acting insulins, have been accidentally administered instead of LANTUS [see Patient Counseling Information (17)]. To avoid medication errors between LANTUS and other insulins, patients should be instructed to always verify the insulin label before each injection. Subcutaneous reproduction and teratology studies have been performed with insulin glargine and regular human insulin in rats and Himalayan rabbits. Insulin glargine was given to female rats before mating, during mating, and throughout pregnancy at doses up to 0.36 mg/kg/day, which is approximately 7 times the recommended human subcutaneous starting dose of 10 Units/day (0.008 mg/kg/day), based on mg/m2. In rabbits, doses of 0.072 mg/kg/day, which is approximately 2 times the recommended human subcutaneous starting dose of 10 Units/day (0.008 mg/kg/day), based on mg/m2, were administered during organogenesis. The effects of insulin glargine did not generally differ from those observed with regular human insulin in rats or rabbits. However, in rabbits, five fetuses from two litters of the high-dose group exhibited dilation of the cerebral ventricles. Fertility and early embryonic development appeared normal. The safety and effectiveness of LANTUS have been established in pediatric patients (age 6 to 15 years) with type 1 diabetes [see Clinical Studies (14.2)]. The safety and effectiveness of LANTUS in pediatric patients younger than 6 years of age with type 1 diabetes and pediatric patients with type 2 diabetes have not been established. The dosage recommendation when changing to LANTUS in pediatric patients (age 6 to 15 years) with type 1 diabetes is the same as that described for adults [see Dosage and Administration (2.2, 2.4), Clinical Studies (14)]. As in adults, the dosage of LANTUS must be individualized in pediatric patients (age 6 to 15 years) with type 1 diabetes based on metabolic needs and frequent monitoring of blood glucose. The effect of hepatic impairment on the pharmacokinetics of LANTUS has not been studied. Frequent glucose monitoring and dose adjustment may be necessary for LANTUS in patients with hepatic impairment [see Warnings and Precautions (5.3)]. The effect of renal impairment on the pharmacokinetics of LANTUS has not been studied. Some studies with human insulin have shown increased circulating levels of insulin in patients with renal failure. Frequent glucose monitoring and dose adjustment may be necessary for LANTUS in patients with renal impairment [see Warnings and Precautions (5.3)]. Excess insulin administration may cause hypoglycemia and hypokalemia [see Warnings and Precautions (5.3, 5.6)]. Mild episodes of hypoglycemia can usually be treated with oral carbohydrates. Adjustments in drug dosage, meal patterns, or exercise may be needed. A metabolism study in humans indicates that insulin glargine is partly metabolized at the carboxyl terminus of the B chain in the subcutaneous depot to form two active metabolites with in vitro activity similar to that of human insulin, M1 (21A-Gly-insulin) and M2 (21A-Gly-des-30B-Thr-insulin). Unchanged drug and these degradation products are also present in the circulation. Effect of age, race, and gender on the pharmacokinetics of LANTUS has not been evaluated. However, in controlled clinical trials in adults (n=3890) and a controlled clinical trial in pediatric patients (n=349), subgroup analyses based on age, race, and gender did not show differences in safety and efficacy between LANTUS and NPH insulin [see Clinical Studies (14)]. The safety and effectiveness of LANTUS given once-daily at bedtime was compared to that of once-daily and twice-daily NPH insulin in open-label, randomized, active-controlled, parallel studies of 2,327 adult patients and 349 pediatric patients with type 1 diabetes mellitus and 1,563 adult patients with type 2 diabetes mellitus (see Tables 9–11). In general, the reduction in glycated hemoglobin (HbA1c) with LANTUS was similar to that with NPH insulin. In Study A, the average age was 39.2 years. The majority of patients were White (99%) and 55.7% were male. The mean BMI was approximately 24.9 kg/m2. The mean duration of diabetes was 15.5 years. In Study B, the average age was 38.5 years. The majority of patients were White (95.3%) and 50.6% were male. The mean BMI was approximately 25.8 kg/m2. The mean duration of diabetes was 17.4 years. In another clinical study (Study C), patients with type 1 diabetes (n=619) were randomized to 16 weeks of basal-bolus treatment with LANTUS or NPH insulin. Insulin lispro was used before each meal. LANTUS was administered once daily at bedtime and NPH insulin was administered once or twice daily. The average age was 39.2 years. The majority of patients were White (96.9%) and 50.6% were male. The mean BMI was approximately 25.6 kg/m2. The mean duration of diabetes was 18.5 years. In these 3 studies, LANTUS and NPH insulin had similar effects on HbA1c (Table 9) with a similar overall rate of severe symptomatic hypoglycemia [see Adverse Reactions (6.1)]. In a randomized, controlled clinical study (Study D), pediatric patients (age range 6 to 15 years) with type 1 diabetes (n=349) were treated for 28 weeks with a basal-bolus insulin regimen where regular human insulin was used before each meal. LANTUS was administered once daily at bedtime and NPH insulin was administered once or twice daily. The average age was 11.7 years. The majority of patients were White (96.8%) and 51.9% were male. The mean BMI was approximately 18.9 kg/m2. The mean duration of diabetes was 4.8 years. Similar effects on HbA1c (Table 10) were observed in both treatment groups [see Adverse Reactions (6.1)]. In a randomized, controlled clinical study (Study E) (n=570), LANTUS was evaluated for 52 weeks in combination with oral antidiabetic medications (a sulfonylurea, metformin, acarbose, or combinations of these drugs). The average age was 59.5 years. The majority of patients were White (92.8%) and 53.7% were male. The mean BMI was approximately 29.1 kg/m2. The mean duration of diabetes was 10.3 years. LANTUS administered once daily at bedtime was as effective as NPH insulin administered once daily at bedtime in reducing HbA1c and fasting glucose (Table 11). The rate of severe symptomatic hypoglycemia was similar in LANTUS and NPH insulin treated patients [see Adverse Reactions (6.1)]. In a randomized, controlled clinical study (Study F), in patients with type 2 diabetes not using oral antidiabetic medications (n=518), a basal-bolus regimen of LANTUS once daily at bedtime or NPH insulin administered once or twice daily was evaluated for 28 weeks. Regular human insulin was used before meals, as needed. The average age was 59.3 years. The majority of patients were White (80.7%) and 60% were male. The mean BMI was approximately 30.5 kg/m2. The mean duration of diabetes was 13.7 years. LANTUS had similar effectiveness as either once- or twice-daily NPH insulin in reducing HbA1c and fasting glucose (Table 11) with a similar incidence of hypoglycemia [see Adverse Reactions (6.1)]. In a randomized, controlled clinical study (Study G), patients with type 2 diabetes were randomized to 5 years of treatment with once-daily LANTUS or twice-daily NPH insulin. For patients not previously treated with insulin, the starting dose of LANTUS or NPH insulin was 10 units daily. Patients who were already treated with NPH insulin either continued on the same total daily NPH insulin dose or started LANTUS at a dose that was 80% of the total previous NPH insulin dose. The primary endpoint for this study was a comparison of the progression of diabetic retinopathy by 3 or more steps on the Early Treatment Diabetic Retinopathy Study (ETDRS) scale. HbA1c change from baseline was a secondary endpoint. Similar glycemic control in the 2 treatment groups was desired in order to not confound the interpretation of the retinal data. Patients or study personnel used an algorithm to adjust the LANTUS and NPH insulin doses to a target fasting plasma glucose ≤100 mg/dL. After the LANTUS or NPH insulin dose was adjusted, other antidiabetic agents, including pre-meal insulin were to be adjusted or added. The average age was 55.1 years. The majority of patients were White (85.3%) and 53.9% were male. The mean BMI was approximately 34.3 kg/m2. The mean duration of diabetes was 10.8 years. The LANTUS group had a smaller mean reduction from baseline in HbA1c compared to the NPH insulin group, which may be explained by the lower daily basal insulin doses in the LANTUS group (Table 11). The incidences of severe symptomatic hypoglycemia were similar between groups [see Adverse Reactions (6.1)]. The safety and efficacy of LANTUS administered pre-breakfast, pre-dinner, or at bedtime were evaluated in a randomized, controlled clinical study in patients with type 1 diabetes (study H, n=378). Patients were also treated with insulin lispro at mealtime. The average age was 40.9 years. All patients were White (100%) and 53.7% were male. The mean BMI was approximately 25.3 kg/m2. The mean duration of diabetes was 17.3 years. LANTUS administered at different times of the day resulted in similar reductions in HbA1c compared to that with bedtime administration (see Table 12). In these patients, data are available from 8-point home glucose monitoring. The maximum mean blood glucose was observed just prior to injection of LANTUS regardless of time of administration. In this study, 5% of patients in the LANTUS-breakfast arm discontinued treatment because of lack of efficacy. No patients in the other two arms discontinued for this reason. The safety and efficacy of LANTUS administered pre-breakfast or at bedtime were also evaluated in a randomized, active-controlled clinical study (Study I, n=697) in patients with type 2 diabetes not adequately controlled on oral antidiabetic therapy. All patients in this study also received glimepiride 3 mg daily. The average age was 60.8 years. The majority of patients were White (96.6%) and 53.7% were male. The mean BMI was approximately 28.7 kg/m2. The mean duration of diabetes was 10.1 years. LANTUS given before breakfast was at least as effective in lowering HbA1c as LANTUS given at bedtime or NPH insulin given at bedtime (see Table 12). Participants were randomized to either LANTUS (N=6264) titrated to a goal fasting plasma glucose of ≤95 mg/dL or to standard care (N=6273). Anthropometric and disease characteristics were balanced at baseline. The mean age was 64 years and 8% of participants were 75 years of age or older. The majority of participants were male (65%). Fifty nine percent were Caucasian, 25% were Latin, 10% were Asian and 3% were Black. The median baseline BMI was 29 kg/m2. Approximately 12% of participants had abnormal glucose levels (IGT and/or IFG) at baseline and 88% had type 2 diabetes. For patients with type 2 diabetes, 59% were treated with a single oral antidiabetic drug, 23% had known diabetes but were on no antidiabetic drug and 6% were newly diagnosed during the screening procedure. The mean HbA1c (SD) at baseline was 6.5% (1.0). Fifty-nine percent of participants had had a prior cardiovascular event and 39% had documented coronary artery disease or other cardiovascular risk factors. BD Ultra-Fine™ needles1 to be used in conjunction with SoloStar are sold separately and are manufactured by BD. Advise patients that they must never share a LANTUS SoloStar prefilled pen with another person, even if the needle is changed. 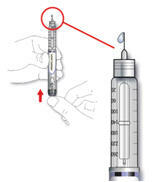 Advise patients using LANTUS vials not to re-use or share needles or syringes with another person. Sharing carries a risk for transmission of blood-borne pathogens [see Warnings and Precautions (5.1)]. Refer patients to the LANTUS "Patient Information" for additional information about the potential side effects of insulin therapy, including lipodystrophy (and the need to rotate injection sites within the same body region), weight gain, allergic reactions, and hypoglycemia. LANTUS, TOUJEO and SoloStar are registered trademarks of sanofi-aventis U.S. LLC. Choosing your injection site: LANTUS is injected under the skin (subcutaneously) of your upper arm, thigh, or stomach area (abdomen). Wipe the skin with an alcohol swab to clean the injection site. Let the injection site dry before you inject your dose. Change (rotate) your injection sites within area you chose with each dose. Do not use the exact spot for each injection. Hydrochloric acid and sodium hydroxide may be added to adjust the pH. BD Ultra-Fine® needles2 are compatible with SoloStar. These are sold separately and are manufactured by BD. Contact your healthcare professional for further information. Check the label on your SoloStar to make sure you have the correct insulin. The LANTUS SoloStar is grey with a purple injection button. Check the appearance of your insulin. LANTUS is a clear insulin. Do not use this SoloStar if the insulin is cloudy, colored or has particles. Keep the injection button pressed all the way in. Slowly count to 10 before you withdraw the needle from the skin. This ensures that the full dose will be delivered. If you are giving an injection to another person, you should remove the needle in an approved manner to avoid needle-stick injuries. Keep your SoloStar in cool storage (36°F–46°F [2°C–8°C]) until first use. Do not allow it to freeze. Do not put it next to the freezer compartment of your refrigerator or next to a freezer pack. Once you take your SoloStar out of cool storage, for use or as a spare, you can use it for up to 28 days. During this time it can be safely kept at room temperature up to 86°F (30°C). Do not use it after this time. SoloStar in use must not be stored in a refrigerator. Do not use SoloStar after the expiration date printed on the label of the pen or on the carton.